A quick update on one of our quick company lunches. It was a colleague's birthday and Le Boss was somehow craving for Nasi Padang so the wife came upon this grand idea of bringing all of us along just so that we can try many dishes at one go. She's been aiming to try out the food here because she always noticed it whenever she drive by Katong area. We were all wondering if this will be similar to the high-end version (collaboration with Tung Lok group?) at Vivo City. As soon as we come upon the entrance we looked at one another and realised that, nahh… maybe not. This place is more down-to-earth, like a typical Nasi Padang shop at Arab Street. All the dishes are presented in large platters behind the glass display. We were all swooning over the various dishes and my lady boss was like, "Okay, let's do it this way. Which are the dishes that you do NOT want?" Haha, she was so game to try almost everything so we opt out those typical dishes like the Telur Balado (boiled eggs in balado chilli) etc. And she ORDERED THE REST. Whoa! 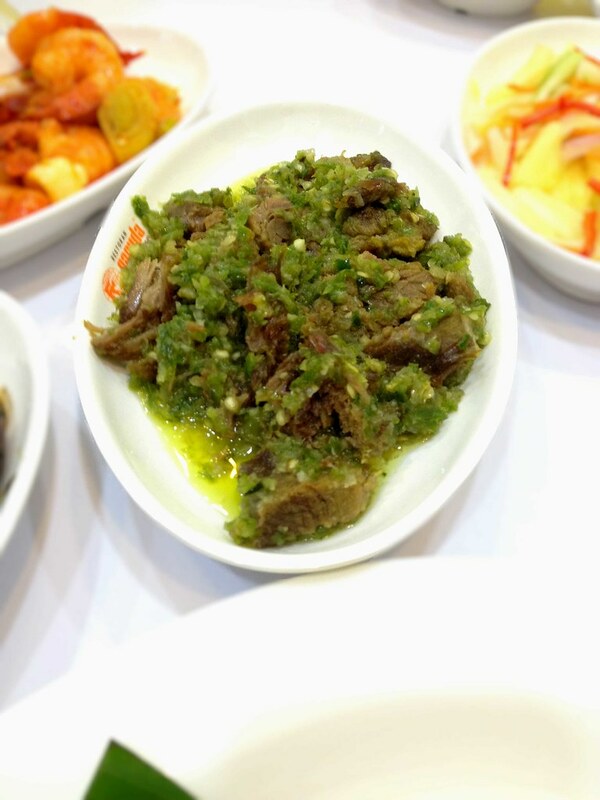 I personally am VERY curious because I'm pretty used to eating real Padang fare because my Father-in-law is a Minang (ethnic of folks in Padang) and of course he loves to eat the cuisine of his ethnicity. My Mum-in-Law (MIL) even learnt how to cook their authentic dishes from her own MIL. So things like sambal balado, dengdeng goreng, kalio/gulai and rendang are often in the menu at home. And from the looks of it, the dishes here seem like the real deal. I am sick and tired of places claiming to be selling Nasi 'Padang' and yet, they sell stuff like 'Sambal Goreng', "Urap' and even 'Asam Pedas'. 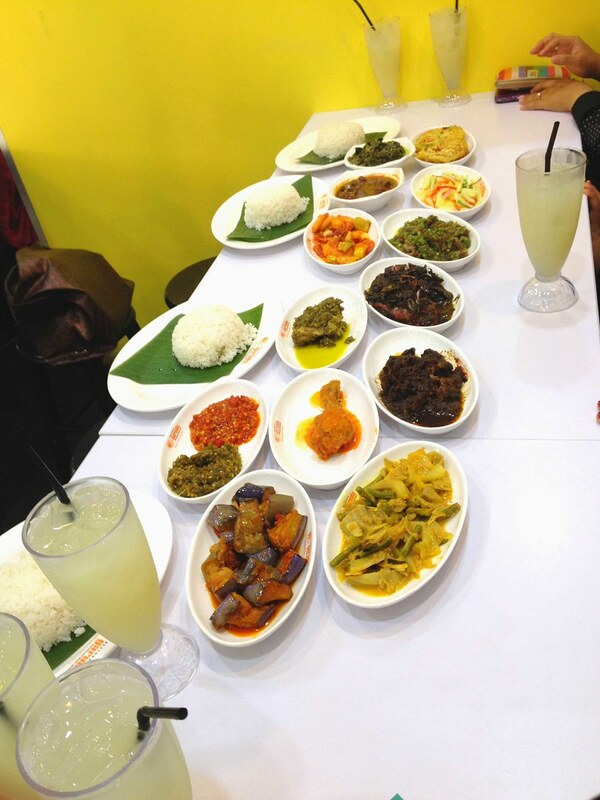 Those dishes are a mish-mash of Padang, Javanese and even Malay cuisine! They might as well claim to serve Nasi 'Campur' ('mix' rice) instead of Nasi Padang. From top-left: Lemak pucuk ubi (tapioca shoots in creamy coconut gravy), telur dadar (omelette), gulai kambing (mutton stew), acar (pickled veggies), sambal udang-petai (prawns & stink beans in chilli), sapi ijo (beef w/ green chilli), ayam balado ijo (fried chicken with green balado chilli), sotong hitam (squid in ink gravy), sambal balado ijo/merah, gulai ayam (chicken in coconut gravy), rendang sapi, terong balado, gulai sayur nangka (lodeh). You might wonder why we ordered the omelette when it's such a simple dish? Well, NOT the Padang version. Their omelette has things like scallions, dessicated coconut and rice flour that makes it crispy like fritters! All their dishes get my thumbs up! And the beef rendang's dark appearance may be a turn-off for some but that actually means that it's been simmering for a long time over low heat so it's really full of flavour (though a bit tough). Doesn't look like much because we opt-out 3-4 dishes in the display. My boss later add-on orders for the more popular dishes. But these are for only 6 pax, mind you (yes, ours is a small company). I went to the washroom at the back of the restaurant and realised that their kitchen staff are truly Indonesians. From Padang, no less.